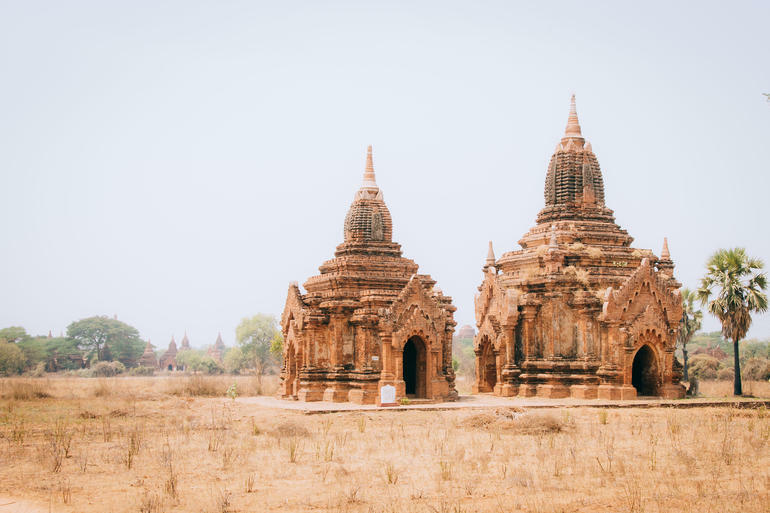 Our guide and driver will pick you up at around 8-9am from your hotel and guiding you along the most significant pagodas and temples of Bagan. Start with a stroll through the colorful local market; this daily market gives each visitor a short insight of the fruits and vegetables which are grown around Bagan or have been transported from high up north of Myanmar. Depending on the season, a variety of seasonal, fresh produce is for sale and gains an insight into the bustling market atmosphere in Bagan. 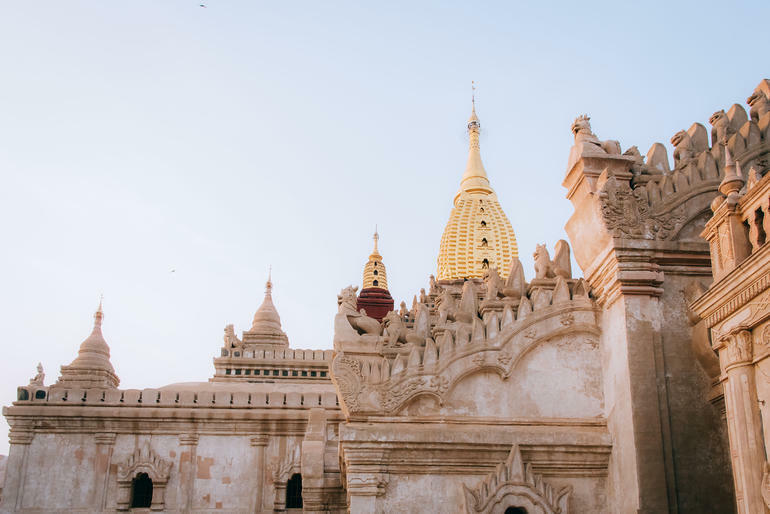 Our first temple stop will be at the Shwezigon Pagoda, built by King Anawrahta in the early 11th century as a religious shrine. 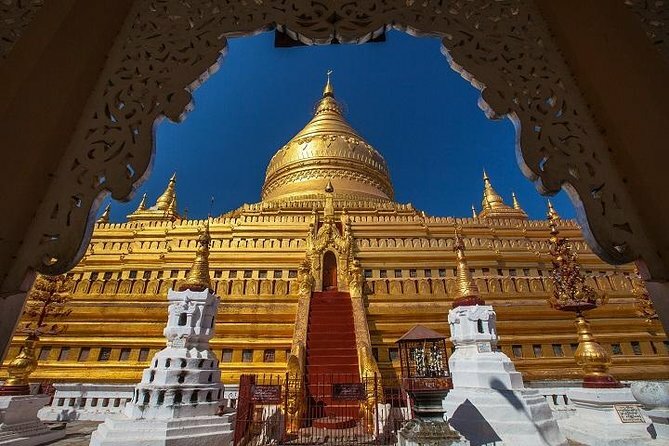 The Shwezigon Pagoda's name was derived from Ground of Victory Jeyyabhumi, and was associated with the two great kings Anawrahta and Kyansitta for their backing of the Buddhist religion. Following this visit, we head out to the Ku Byauk Gyi temple, known for its superb murals of Jataka scenes. 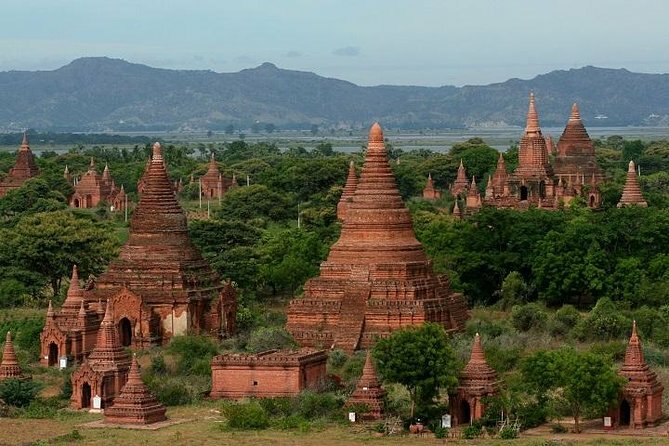 As the Bagan temples are dotted on this plain, visuals from the immense site are some of the features we cannot pass by. The Bu Lei Thee Pagoda is one of these well-maintained temple ruins and acts perfectly as a platform to admire the plains with temple and pagodas as far as the eye can see. The Ananda Temple is one of the more recognizable ones in the region with four magnificent standing Buddha images. After lunch, we continue our exploration tour with a visit to one of Myanmar’s most treasured handicrafts, a lacquer ware craftsmen’s workshop in nearby Myinkaba village. Next will be Manuha Temple, constructed in Mon style in 1059 and the Nanbaya Temple, a unique sandstone monument said to have been the palace of King Manuha. We end the day at the sunset view point to enjoy the majestic sunset over Bagan. This experience is non-refundable. If you cancel, you will not be eligible for a refund. Our guide Khin Thin Swe was an absolute delight. We had such a wonderful time Thanks to Khin. She was extremely knowledgable, patient, polite and so kind and thoughtful! I truly believe it would not have been the same without Khin! We visited Shwezigon Pagoda, Ananda Temple and the gorgeous Htilominlo Temple. We also visited the 1000 year old reclining buddha and had a wonderful experience walking through the old market. Lunch was at a very beautiful restaurant with very tasty food. We ended our tour watching the sunset but sadly it was a hazey evening. Be sure to request for Khin Thin Swe from Asian Trails. You can customize the tour to your liking. She was very open to suggestions. I highly recommend this tour.